Our Prague airport transfers are safe, reliable and comfortable, and we charge one fixed price to travel to any hotel or apartment in Prague. Our taxis, minibuses and coaches are modern high quality vehicles, with professional English speaking drivers. Our Prague airport transfers serve everyone, from one person to several hundred people. Our modern fleet of taxis, minibuses/MPVs and coaches are ready to meet your flight 24 hours a day, 7 days a week. One of our polite English speaking drivers will meet you in the arrivals hall at Prague Airport, holding a board with the Prague Experience logo on. The driver will help carry your luggage to the taxi, and will give you a free Prague map during the trip. Prague Airport (officially Vaclav Havel Airport Prague) is 17km from the city centre, a journey time of around 30 minutes by taxi. All international flights arrive at this airport. 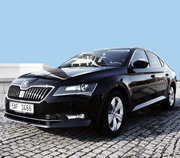 Our Prague Airport taxis charge one fixed price to travel to anywhere in the city. All taxes, waiting fees and parking charges are included in the price, there are no hidden extras. You travel in a private vehicle; you do not share it with anyone else. If your flight is delayed, even by several hours, your driver will still be there to greet you, and at no extra cost; we monitor your flight progress. And if you are travelling with young children, we can organise child seats for free. 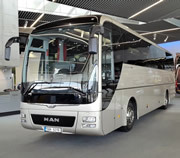 Prague Airport coach Your booking confirmation includes the driver's phone number, in case of any last minute hitches. In short, we offer you a warm welcome to Prague, ensuring your trip starts off on the right foot. Our airport transfers service is for everyone. You do not need to book a hotel with us. Note: Our taxis comfortably carry up to 4 passengers with regular luggage. If you have extra luggage and/or prefer a minibus/MPV, mention it in Special Requests on the booking form (minibus price will apply). Arriving at a Prague Railway or Bus Station? Our taxis also pick up from Prague railway and bus stations. On the booking form, enter your train or coach details in place of flight details, and state the name of the station in Special Requests. 17 years of first-class service.